JACKSONVILLE, Fla., Jan. 23, 2019 /PRNewswire/ -- The unemployment rate for non-active duty warriors improved by 40 percent over the past five years, according to data gathered from the 2018 Wounded Warrior Project® (WWP) Annual Warrior Survey. 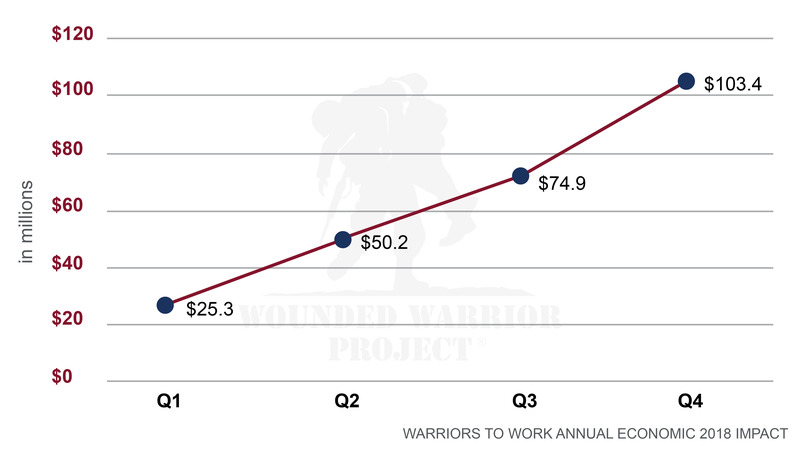 Additionally, WWP reports that for the first time in Warriors to Work® history, it has surpassed $100 million in economic impact in a single year, which directly represents the combined total salaries of newly employed veterans served by WWP. Tom Kastner, WWP financial wellness vice president, credits this success to warriors with an enthusiastic desire to succeed, an emphasis on partnering with local and national companies seeking quality employees, and the hard work and commitment of WWP staff. "The program starts with the relationship between the warrior and Wounded Warrior Project staff," said Tom. "We invest time to fully understand the warrior's background, skill sets, and future goals. Then, we work on the fundamentals such as building resumes, job interview preparation, and creating more direct hire programs where warriors interact with local company representatives face-to-face." WWP's career counseling program serves warriors across the country and in U.S. territories. Tom noted that building relationships with local and national companies has contributed to the quality and success of Warriors to Work. "We seek relationships that are mutually beneficial to warriors and employers," said Tom. "We work to place warriors in meaningful, sustainable jobs that provide paths for long-term growth while offering return on investment for the hiring company." Regular meet-and-greet activities designed for face-to-face interactions are a key aspect of the Warriors to Work strategy. Local companies find it helpful to meet warriors firsthand, and in many instances, can conduct initial interviews during the activity. "With direct hire programs, warriors have an increased likelihood of gaining meaningful employment and remaining in those roles," said Tom. "This year, we want to increase the number of direct hire experiences and raise the retention rate." To help warriors find meaningful employment, visit https://wwp.news/Donate.